KUALA LUMPUR (Reuters) - Malaysia's prime minister said on Wednesday his government planned to develop some offshore rocks which were the subject of a territorial dispute with Singapore, days after he cancelled a big rail project with his southern neighbour. The International Court of Justice (ICJ) awarded the outcrop, known as Middle Rocks, near the opening of the Straits of Singapore, to Malaysia in 2008. At the same time, the Netherlands-based court ruled the nearby Pedra Branca island belonged to Singapore. Malaysia sought a review of that ruling last year, in the hope of restaking its claim to Pedra Branca. Singapore opposed Malaysia's bid to review the ruling and the Singapore foreign ministry said on Wednesday the ICJ had informed it Malaysia had withdrawn that request. Malaysia's newly elected prime minister, Mahathir Mohamad, told a news conference that Malaysia had already been building structures on Middle Rocks. "It is our intention to enlarge Middle Rocks so we can form a small island for us," he said. Mahathir declined to elaborate saying the plan had not been finalised. The Singapore government did not immediately have a comment on the Malaysian plan to build on the rocks. While Singapore has not been seeking to revive any claim to Middle Rocks, it is likely to keep a close eye on Malaysia's plan to develop the outcrop at the opening of one of the busiest shipping lanes in the world. Malaysian state news agency Bernama reported last year the opening of a maritime base called Abu Bakar on Middle Rocks. The base comprises a jetty linking two main rocks - some 320 metres apart - a lighthouse and a helipad, a video posted on Facebook by the Sultan of the Malaysian state of Johor shows. 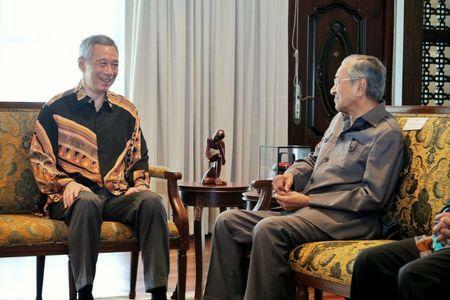 Mahathir has already made a major decision affecting relations with Singapore, cancelling a project to build a high-speed rail link between Malaysia's capital, Kuala Lumpur, and the city state. Singapore's trade ministry said in Monday that they had not received any official communication from Malaysia on the decision. Singapore was once part of Malaysia but they separated acrimoniously in 1965, clouding diplomatic and economic dealings for years. Some of the frostiest years were during Mahathir's previous tenure as prime minister between 1981 and 2003.